Hi, I'm Rosuav, and I'm a geek. Oh, this isn't Geek's Anonymous? Well, I wasn't very anonymous... Anyway. This page exists only as a hub, as a place to host or link to other resources. The name Rosuav is best known from my use of it on Threshold RPG, an awesome online game if you're at all interested in roleplaying. It's a MUD, so you don't need the latest hardware. And if you happen to like the idea of rolling virtual dice and engaging in epic storytelling through Dungeons and Dragons, check out the small community of Minstrel Hall, operated by me and free to all. Have fun, and be free! Obscure-but-awesome meets obscure-but-awesome: Pike 7.8.700 for OS/2. Download the main binary archive, unzip it to some new directory someplace, and run install.cmd; you may also need some or all of its required DLLs - unzip to some directory on LIBPATH. Of Dice And Men like geeks, especially those who help them make their film. 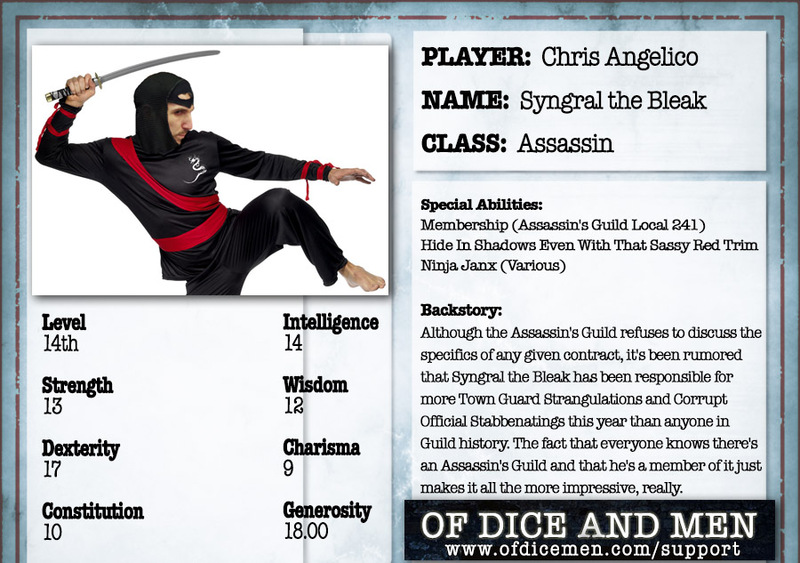 They made me a commemorative character sheet... which is pretty awesome! Also hosted here are: the archive of the now-defunct STEA Participation Challenge, the Rosuav Hymnal, Rosuav's 1, the Pike-GTK2 Documentation Project (deprecated), and a simple Chrome extension for looking up NIV Bible references, David Duffey's Lotta Little Lists, and the Alice in Wonderland mailing list. I make no apologies for the bland look of this page; it is purely a page of links, and like Google, intends for people to spend less time here and more time where they want to be.